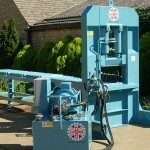 The machine has a power feed roller system; each individual roller is chain driven by a hydraulic motor and gearbox. 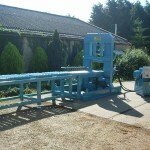 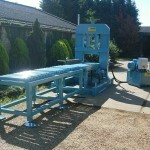 This machine has extra load rollers to enable loading stone scants directly onto feed rollers to be taken to the blade. 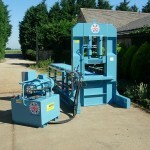 This machine comes fully equipped with a 20hp three phase power unit with a high output pump fitted as standard.